After qualifying last week at the Regional Tournament in Rocky Ford the following wrestlers qualified to go on to wrestle in the Colorado Super State Tournament. 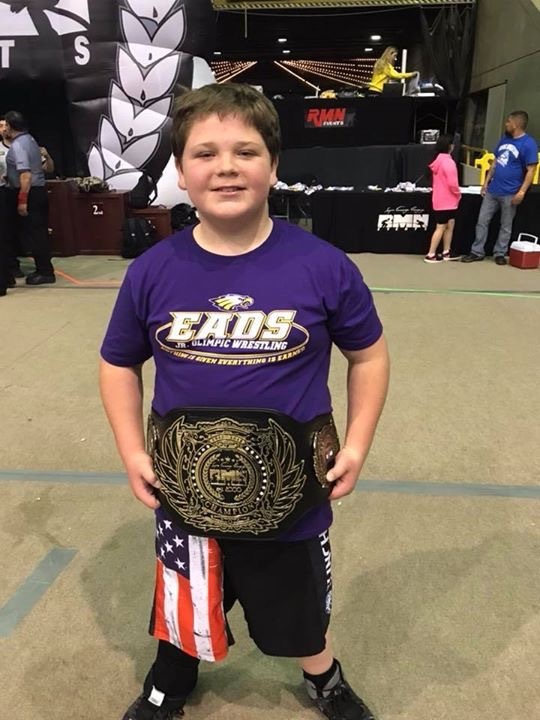 Those that wrestled from Eads were, Taite Johnson, Chase Stolzenberger, Ty Michael and Donte Sierra in the Junior High Division and in Elementary Division were Stockton Mitchek and Spencer Uhland. Spencer Uhland returned home with the Championship 4th/5thage division heavyweight belt. He had Zachariah Tarin from Wray for his first match which he won with an 8-3 decision After all the gestures of a State Tournament with a Parade of Champions and introductions of the kids, Uhland was wrestling Trason Gartrell from Sanford for the title. The match lasted 1:11 with Uhland getting the pin and walked to the top of the awards stand to receive his belt. Although the other young men did not place they had exciting matches and valuable mat time which will help them get ready for their high school state experience when they compete at that level. Good Job boys on a great season.